A pocket-sized device has been created which could help save the sight of millions of people around the world. 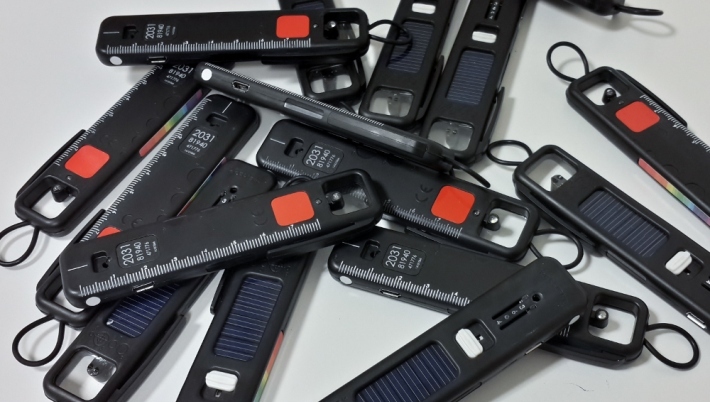 A team at the University of St Andrews has developed the solar-panel powered ophalmoscope with the aims to help health workers in low-income countries to detect signs of preventable sight loss. Designed as an easy-to-use tool, the Arclight enables users to make on the spot diagnosis decisions and is ideal for outreach or screening programmes. It can also be used as an otoscope to look into ears and help prevent deafness. A study led by the International Centre for Eye Health in London found it performed as well as traditional devices costing up to 100 times as much. The Arclight allows users to see the front and back of the eye, making it possible for users to identify conditions including cataract, glaucoma and diabetes. Thanks to the collaboration of Fred Hollows Foundation and the International Agency for Prevention of Blindness, thousands of Arclight devices have already been distributed to countries around the world, including Malawi, Ethiopia, Kenya, Tanzania, Rwanda, Ghana, Fiji, Indonesia and the Solomon Islands. Dr Andrew Blaikie, a clinical academic at the University of St Andrews, and Eye Surgeon at Queen Margaret Hospital with NHS Fife, helped lead a team of researchers which also included scientists from the University of Leicester and University College London. Dr Blaikie, said: “Arclight is the result of years of hard work by a small team of enthusiasts. These efforts have brought simple, frugal yet highly effective tools to health care workers who would otherwise be unable to make the early diagnoses needed to prevent needless blindness. “The work of the Global Health Team at St Andrews has helped focus attention on the exact needs and challenges of health care workers in low-income countries. We now aim to add internal memory loaded with teaching material and a clip to allow image capture with mobile phone cameras to the next version of the device. At the same time we are developing several other potentially disruptive low cost diagnostic tools aimed at serving the needs of health care workers in poorer countries. The University of St Andrews has now established a spin-off company to promote sales of the device and coordinate the subsidised distribution to low-income countries.